SSR LLC – Dow/DuPont – Again in 2017! 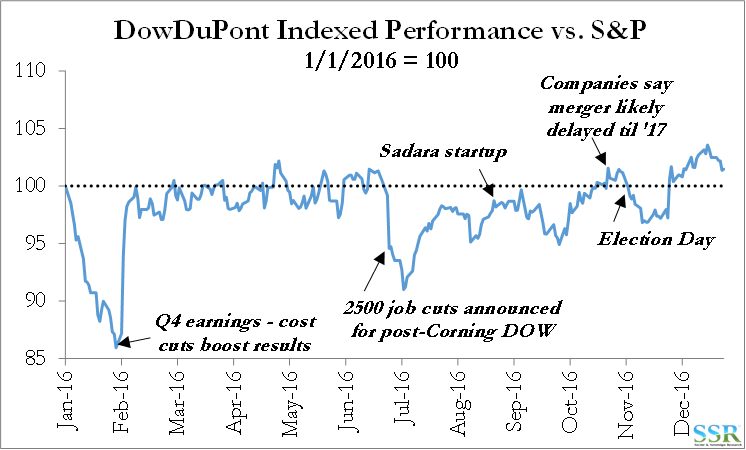 Dow/DuPont – Again in 2017! Dow and DuPont will likely continue to be good investments in 2017 but only if they complete the announced merger. 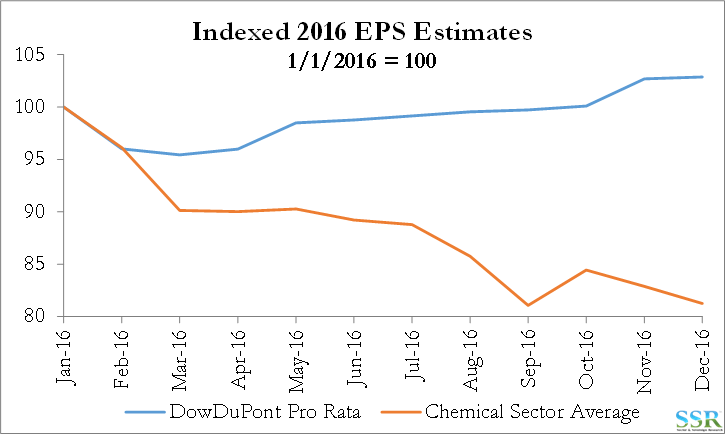 They outperformed a weak chemical sector in 2016. To outperform from here the deal needs to close – taking away the risk that the regulators say no, which hangs over both names today. We would haircut price expectations by a few percent to reflect synergies likely lost because of divestments, but still see as much as 15-20% upside from getting the deal done. The tailwinds from the cost initiatives and relatively impressive earnings countered a general cautious market with respect to large cap Chemicals in 2016. Without the deal you have two relatively expensive stocks – DOW especially so versus other ethylene exposed names – both needing another strategy if the regulators simply say no. We think the cost and break-up opportunity at DD is significant and consequently the DD stand-alone plan probably looks better the day after the deal is blocked than the DOW plan. We would own DD over DOW as a result. Longer-term, with a potential strong ethylene/polyethylene cycle Dow may be the better investment, but today LYB looks like a much cheaper way to play that cycle. Upside from better polyethylene margins, new capacity at Dow, infrastructure spending etc. Downside from Teflon related litigation, dollar strength and economic weakness, etc. Real upside comes from a successful transaction, the Ag spin, some select additional divestments rather than a specialty spin, in our view, coincident with a polyethylene cycle. This generates as much as $7.00 per share of peak earnings and as much as 40-50% upside. At best this would be a late 2018 event – more likely 2019. The risk of owning Dow and DuPont in 2016 was that a lack of action would result in a waiting game until the deal closed and the stocks would likely languish. We called for news flow from both companies during the year with respect to unilateral cost cutting opportunities and both delivered, while at the same time delivering solid earnings. Consequently, shareholders did get some outperformance, but not much – Exhibit 2. 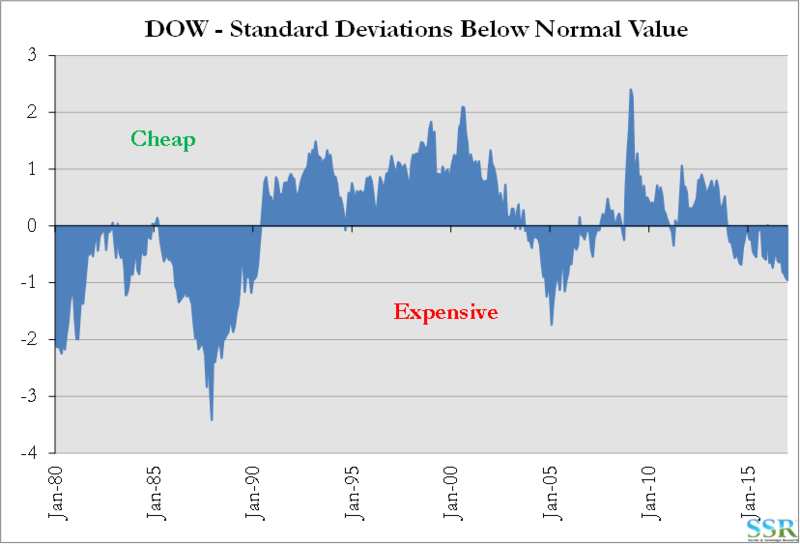 DOW’s outperformance versus DD in 2016 closed an arbitrage around the deal terms which existed at the beginning of 2016. The cost cutting and much greater focus on operations at both companies resulted in much better results in 2016 than peers – Exhibit 1. 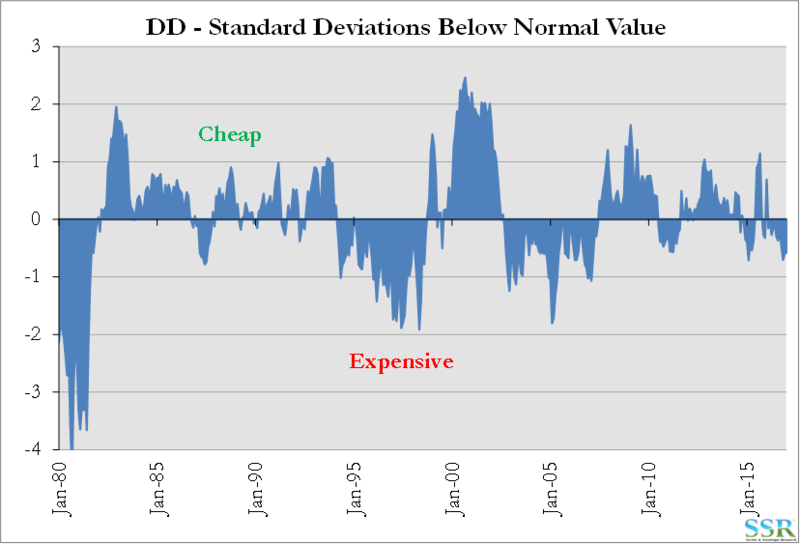 Despite this and the news flow, the stock only outperformed in line with the more “value” based rally which started mid-year – Exhibit 3 – and was not really driven by the cost news flow, which happened before the rally. The stocks rallied on earnings at the end of Q2 and Q3. 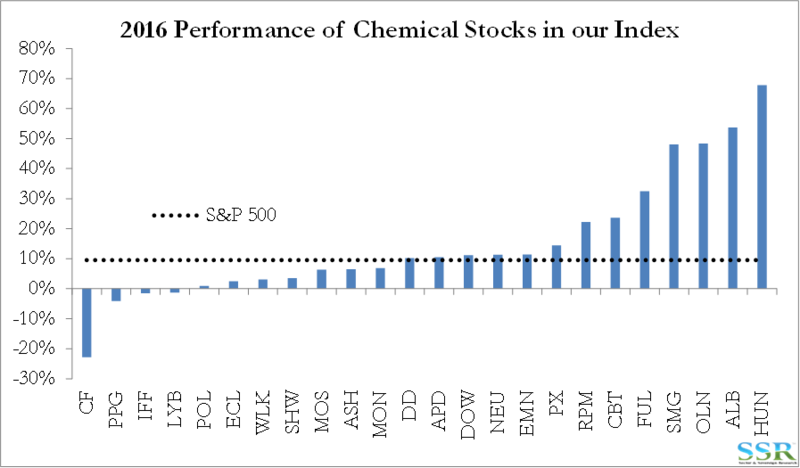 However, both DOW and DD did significantly better than our Chemical index which underperformed the S&P 500 by 4%. 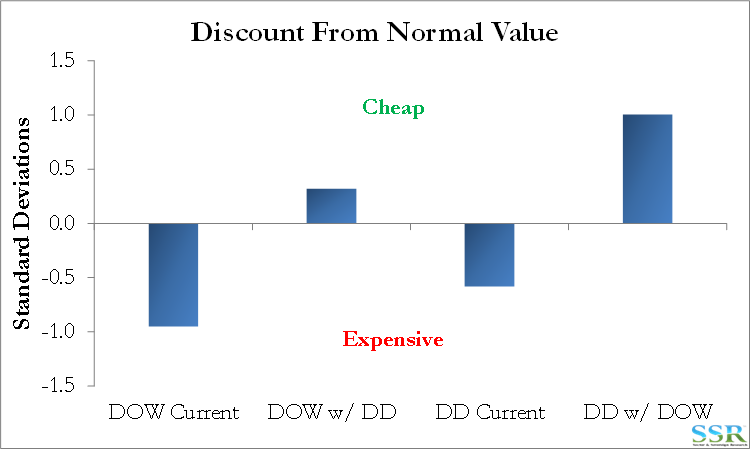 It is cap weighted, and includes both DOW and DD – performance by stock is summarized in Exhibit 4 – of the larger-cap names only PX outperformed DOW/DD. 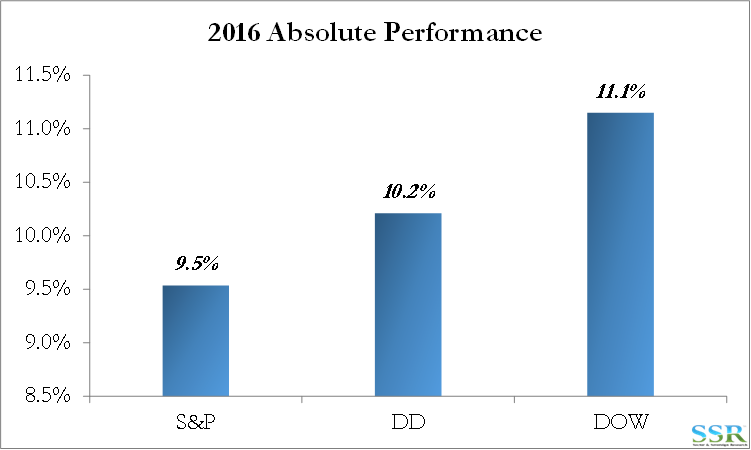 Given DOW and DD’s outperformance versus the sector and versus the market in 2016 and given that most of the additional cost initiatives are now public, should these be the go to stocks for 2017 also? To buy DOW today over LYB, you have to believe in the deal closing and that the companies can achieve the synergies and the splits/sales etc. We believe that DD will go down a value creative break-up route anyway if the deal does not close and consequently we would prefer DD to DOW as a way to own the pending transaction. Given the limited move in the stocks relative to the S&P in 2016 we would only haircut the valuation targets that we had for the combined entity in January of last year by the amount of synergies that might be given up by forced divestments. Worst case would likely be the synergy targets being cut by $500 million, which is $0.15 per share of earnings – $2.20-$2.50 per share in terms of value. This would still give 15-20% upside from current levels assuming the deal closes – until it does we struggle to see another catalyst. DOW/DD remains one of our favorite stories, but it is not without its risks today, and in the large cap space we prefer LYB as a way to play the commodity cycle. Dow and DuPont are expensive stocks versus their own history – Exhibits 5 and 6 – and versus the group – Exhibit 7. They are not the most expensive names in the space and neither is as expensive versus its own history as at prior extremes, but even so, you have to believe a lot to be a buyer here. You have to believe the deal and that the synergies can be delivered and retained – this effectively boosts “normal earnings” by around $1.00 per DOW share ($1.28 per DD share) and on that basis the stocks have some room to run – Exhibit 8. To get more than the implied value of the synergies a couple of things need to happen: we need to be right on the polyethylene cycle and the combined company probably needs to make some bolder/different moves than currently proposed. The polyethylene cycle is less important to DOW/DD than to DOW alone, but the combined company will still have as much as 8 pounds of polyethylene per share (Exhibit 9), more with the expansions in the US and Saudi Arabia – closer to 9 pounds per share by 2019. Integrated margins peaked at around 50 cents per pound in 2014 and are in the 25-30 cents per pound range in the US today with margins expected to weaken in 2017. A move back to the 2014 peak would add as much as $2.00 per share to combined DOW/DD earnings. At a stretch the new company could earn $7.00 per share in a peak with the cycle and with synergies – not accounting for any accretive divestments. This would support a Dow share price in the $80-85 range, 40-50% higher than today. We would consider this an “everything goes right” stretch target for 2019/20.